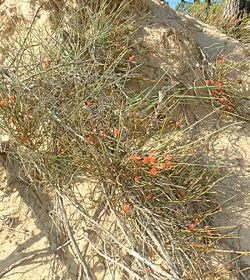 The Ephedra plant has been identified as a possible source of the sacred Haoma of Zoroastrianism. Haoma (from the Avestan language) refers to both a ritual drink of importance in Indo-Iranian culture as well as a deity. Haoma was composed from a plant that caused an overwhelming and empowering feeling of intoxication, which was perceived to be a quality of the gods. Scholars are unsure about the exact identity of the Haoma plant, or whether it was the same as the Vedic Soma, proposing several possible candidates including, Ephedra. Sacred haoma played a significant role in Zoroastrian religion and in later Persian culture and mythology. In the Avesta, three chapters of the Yasna and some additional fragments among the Yashts deal with haoma. In these texts, Haoma is described as "righteous" and "furthers righteousness," is "wise" and "gives insight" (Yasna 9.22). It is also described as "Golden-green eyed," a "star-adorned, spirit-fashioned mortar," and is the guardian of "mountain plants upon the highest mountain peak" (Yasht 10.90). Additionally, the Haoma plant is a central element in the legend surrounding the conception of Zoroaster. According to Zoroastrian tradition, it is said that Zoroaster received his revelation on a riverbank while preparing parahaoma where the celebrant makes offerings possessing haoma. In Zoroastrian hymns, Haoma is said to appear before Zoroaster in the form of a "beautiful man" (this is the only anthropomorphic reference), who prompts him to gather and press haoma for the purification of the waters. Haoma is also the first priest, installed by Ahura Mazda with the sacred girdle aiwiyanghana (Yasna 9.26) who serves the Amesha Spenta (Vohu Manah Avestan, middle Persian Vahman or Bahman) in this capacity (Yasht 10.89). However,Haoma is the only divinity with a Yasht who is not also represented by a day-name dedication in the Zoroastrian calendar. Without such a dedication, Haoma has ceased to be of any great importance within the Zoroastrian hierarchy of angels. Both Avestan haoma and Sanskrit soma derived from proto-Indo-Iranian *sauma. The linguistic root of the word haoma, hu-, and of soma, su-, suggests "press" or "pound." Thus, both Soma and Haoma are derived from Proto-Indo-Iranian verb "to press," referring to the process by which the drink was made (Hindus also referred to the drink as amrita, or "the wine of immortality"). The Middle Persian form of the name is hōm, which continues to be the name in Modern Persian and other living Iranian languages. The plant has stems, roots and branches (Yasna 10.5). It has a pliant asu (Yasna 9.16). The term asu is unclear. It has been variously translated as twigs' (according to Dieter Taillieu), 'stalk' (according to Robert Wasson), "fiber" or "flesh" (according to Ilya Gershevitch), and "sprouts" (according to Lawrence Heyworth Mills). The mildly intoxicating extract can be consumed without negative side effects (Yasna 10.8). It is nourishing (Yasna 9.4, 10.20) and "most nutritious for the soul" (Yasna 9.16). The twigs are repeatedly pounded in the presence of a little water, which suggests ancient haoma was also water-soluble. The twigs have to be imported by Indian-Zoroastrians, who believe that they are, for climatic reasons, not obtainable on the Indian subcontinent. Very small quantities are produced. According to Falk, Parsi-Zoroastrians use a variant of Ephedra, usually Ephedra procera, imported from the Hari-rud valley in Afghanistan. Since the late 1700s, when Anquetil-Duperron and others made portions of the Avesta available to western scholarship, several scholars have sought a representative botanical equivalent of the haoma as described in the texts and as used in living Zoroastrian practice. Most of the proposals concentrated on either linguistic evidence or comparative pharmacology or reflected ritual use. Rarely were all three considered together, which usually resulted in such proposals being quickly rejected. 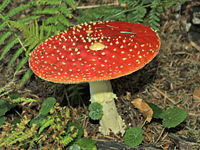 Amanita muscaria, the possible source of Haoma. In the late nineteenth century, the highly conservative Zoroastrians of Yazd (Iran) were found to use Ephedra (genus Ephedra), which was locally known as hum or homa and which they exported to the Indian Zoroastrians. The plant, as Falk also established, requires a cool and dry climate, that is, it does not grow in India (which is either too hot or too humid or both) but thrives in central Asia. Later, it was discovered that a number of Iranian languages and Persian dialects have hom or similar terms as the local name for some variant of Ephedra. Considered together, the linguistic and ritual evidence appeared to conclusively establish that haoma was some variant of Ephedra. In the latter half of the twentieth century, several studies attempted to establish haoma as a psychotropic substance, and based their arguments on the assumption that proto-Indo-Iranian *sauma was a hallucinogen. This assumption, which invariably relied on professed Vedic 'evidence' (one hymn of c. 120), was, as Falk (1989) and Houben (2003) would later establish, not supported by either the texts or by the observation of living practice. Moreover, the references to entheogenic properties were only in conjunction with a fermentation of the plant extract, which does not have enough time to occur in living custom. In the conclusion of his observations on a 1999 Haoma-Soma workshop in Leiden, Jan E. M. Houben writes: "Despite strong attempts to do away with Ephedra by those who are eager to see sauma as a hallucinogen, its status as a serious candidate for the Rigvedic Soma and Avestan Haoma still stands." This supports Falk, who in his summary noted that "there is no need to look for a plant other than Ephedra, the one plant used to this day by the Parsis." The Yazata Haoma, also known by the middle Persian name Hōm Yazad, is the epitome of the quintessence of the haoma plant, venerated in the Hōm Yašt, the hymns of Yasna 9-11. In Ferdowsi's Shahnameh, which incorporates stories from the Avesta (with due acknowledgement), Hom appears as a hermit, dweller of the mountains, incredibly strong. He binds Afrasiab (middle Persian, Avestan: "the fell Turanian Frangrasyan," Yasna 11.7) with the sacred girdle, and drags him from deep within the earth (named the hankana in Avestan, hang-e-Afrasiab in middle Persian) where Afrasaib has his "metal-encircled" kingdom that is immune to mortal attack. In another episode, Vivaŋhat is the first of the humans to press haoma, for which Hom rewards him with a son, Jamshid. Yasna 9.3-11 has Zoroaster asking the divinity who (first) prepared haoma and for what reward, to which Haoma recalls Vivahngvant (Persian: Vivaŋhat) to whom Yima Xshaeta (Jamshid) is born; Athwya (Abtin) to whom Thraetaona (Feredon) is born; and Thrita to whom Urvaxshaya and Keresaspa (Karshasp and Garshasp) are born. The latter two are also characters in priestly heroic tradition, and among conservative Zoroastrians of the hereditary priesthood, Haoma is still prayed to by those wanting children (in particular, honorable sons who will also become priests). The account given in the Indian Vedas closely agrees with that of the Iranian Avesta. The first preparers of Soma are listed as Vivasvat, who is the father of Yama and Manu, and Trita Aptya. A legendary "White Hom" grows at the junction of the "great gathering place of the waters" (named Vourukasha in Avestan, middle Persian: Varkash) and a mighty river. (proto-Indo-Iranian: harahvati, Avestan: Aredvi Sura, middle Persian: Ardvisur) . According to the Zadspram, at the end of time, when Ormuzd triumphs over Ahriman, the followers of the good religion will share a parahom made from the "White Hom," (named Gaokerena in Avestan, middle Persian: Gokarn) and so attain immortality for their resurrected bodies (Zadspram 35.15). The Indian-Zoroastrian belief also manifests itself in the present-day Zoroastrian practice of administering a few drops of parahaoma to the new-born or dying. The belief also appears to be very old, and be cross-cultural. As Falk, recalling Aurel Stein's discovery of Ephedra plants interred at first century C.E. Tarim Basin burial sites, notes: "An imperishable plant, representing or symbolizing the continuity of life, is most appropriate to burial rites." It is possible that the barsom (Var. Avestan baresman) bundle of twigs was originally a bundle of Haoma stalks. The Haoma divinity is identified with priesthood, while the barsom stalks "cut for the bundles bound by women" (Yasna 10.17) is the symbol and an instrument of the Zoroastrian priesthood. Today, the barsom is made from pomegranate twigs (cf: preparation of parahaoma for the Ab-Zohr). The Haoma plant is a central element in the legend surrounding the conception of Zoroaster. In the story, his father Pouroshaspa took a piece of the Haoma plant and mixed it with milk. He gave his wife Dugdhova one half of the mixture and he consumed the other. They then conceived Zoroaster who was instilled with the spirit of the plant. According to Zoroastrian tradition, Zarastrutra received his revelation on a riverbank while preparing parahaoma for the Ab-Zohr (Zatspram 21.1), that is, for the symbolic purification of Aban ("the waters"). This symbolic purification is also evident in Yasna 68.1, where the celebrant makes good for the damage done to water by humanity: "These offerings, possessing haoma, possessing milk, possessing pomegranate, shall compensate thee." Beyond the establishment of a common origin of haoma and soma and numerous attempts to give that common origin a botanic identity, little has been done to compare the two. As Indologist Jan Houben also noted, in the proceedings of a 1999 workshop on Haoma-Soma, "apart from occasional and dispersed remarks on similarities in structure and detail of Vedic and Zoroastrian rituals, little has been done on the systematic comparison of the two." Houben's observation is also significant in that, as of 2003, no significant comparative review of cultural/sacred Haoma/Soma had extended beyond Alfred Hillebrandt's 1891 comparison of the Vedic deity and the Zoroastrian divinity. All more recent studies that address commonality have dealt only with botanic identification of proto-Indo-Iranian sauma. Houben's workshop dealt with "the nature of the Soma/Haoma plant and the juice pressed from it" and that "the main topic of the workshop (was) the identity of the Soma/Haoma." These included a side-by-side enumeration of descriptions of the plant from the ancient texts focusing on the Vedic attributes because of the lack of Avestan ones. ↑ Falk (1989), p 86. ↑ Falk (1998), p 41/42. ↑ Alfred Hillebrandt, Vedische Mythologie. I: Soma und verwandte Goetter (Breslau: Koebner, 1891). Boyce, Mary. Zoroastrians: Their Religious Beliefs and Practices. London: Routledge, 1979. ISBN 0415239036. Dhalla, Maneckji. History of Zoroastrianism. New York: Oxford University Press, 1938. ISBN 0404128069. Falk, Harry. Soma I and II, Bulletin of the School of Oriental and African Studies (BSOAS) 52/1 (1989). Gnoli, Gherardo. Zoroaster in History. New York: Oxbow, 2000. ISBN 9780933273436. Hillebrandt, Alfred. Vedische Mythologie. I: Soma und verwandte Goetter. Breslau: Koebner, 1891. Houben, Jan E.M. The Soma-Haoma problem. Electronic Journal of Vedic Studies 9/1a(2003). Houben, Jan E.M. Report of the Workshop. Electronic Journal of Vedic Studies 9/1b(2003). Taillieu, Dieter, and Mary Boyce. Haoma. In Encyclopaedia Iranica. New York: Mazda Pub, 2002.